An accessible and clear-eyed handbook that offers fundamental tips, tools, and sanity-saving ideas to guide you through the seasons and help you better manage the mood-altering pressures of everyday life—“Try it. I took my blood pressure before and after. It dropped” (The New York Times). In the form of weekly journal entries over the course of a year, bestselling author, journalist, and mental health activist Rachel Kelly shares the fifty-two strategies that have helped her cope with depression and anxiety and maintain a calm, happy lifestyle. Walking on Sunshine requires no complicated program or an overhaul of your current way of life. These are simple shortcuts to lighter, more conscious living—tangible rituals you can use to care for your body and mind. In the pages of this engaging book, you’ll find breathing techniques, poetry, prayer, philosophical nuggets, and meditations, all of them gentle suggestions designed to bring more ease and equanimity into your daily life. 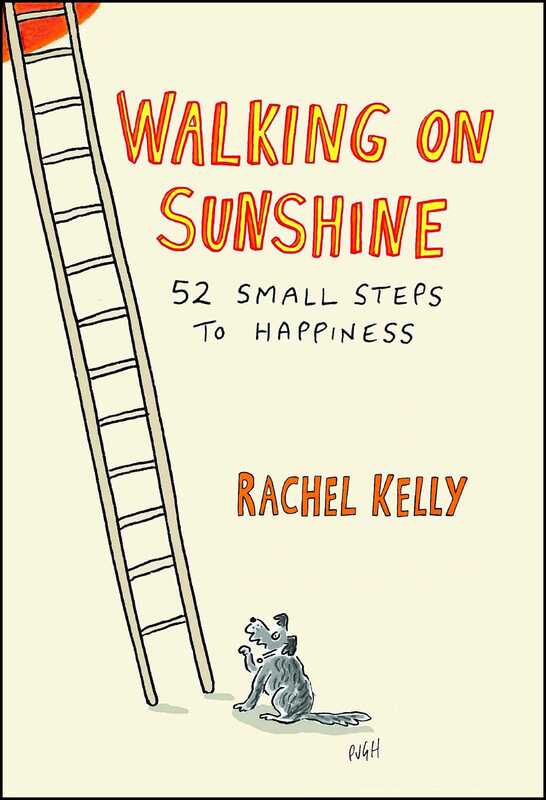 Written in the candid, conversational style of a good friend and accompanied by delightful cartoon illustrations, Walking on Sunshine is a constant, supportive companion that will see you through your ups and downs. In this book I share what I’ve learned about staying calm and happy in a diary of my year. For me the two are intrinsically linked: I often feel joyful as a result of feeling calm. Last year, I published a memoir entitled Black Rainbow: How Words Healed Me—My Journey Through Depression in which I describe my past experience of debilitating depression and how I recovered from this serious illness. The book was based on diary entries, letters, and emails that I wrote at the time. Since then, I’ve continued to get better. I’ve also continued my habit of writing letters and keeping a diary. And this time, I’ve been able to move away from the heavy stuff and focus on what helps me through what Freud called “ordinary human unhappiness”—the inevitable ups and downs of everyday life rather than depression. Most days now, I feel steady and well—and sometimes I even feel as if I’m walking on sunshine. I’ve experienced this newfound sense of well-being partly because I’ve been very lucky. When my memoir came out, I was fortunate to receive letters and emails from readers who were generous enough to share their own stories. I’ve since tried out many of their suggestions for leading a happier life, some of which are included here. Other ideas have come from giving talks and running workshops for mental health charities, schools, universities, and businesses. The result is Walking on Sunshine, a collection of fifty-two small, sanity-saving tools that have worked for me and proved to be my friends throughout the year. All of them have served as shortcuts to happier, more conscious living. In general, I’ve found that while these steps may not directly lead to happiness, it often follows as a by-product. Such is the paradoxical nature of happiness. You cannot simply become happy, like flicking a switch in your head. Rather happiness is often an indirect consequence of the way we think and our actions, whether it’s tending a garden or helping others. I’ve also found that small steps work best. They are not only achievable but add up and have been the easiest way for me to make sustainable changes. I’ve found that every time I try a more dramatic approach, I set the bar too high and end up feeling a failure. It’s proved helpful to be aware of the particular pressures of different times of year. As a mother, I find there are challenges associated with the academic calendar. And Christmas in particular is a season that I’ve found needs a health warning on it. My state of mind is also affected by changes in weather and light. The book is an eclectic mix, something of a salad bowl of ideas from which readers can pick and choose what works for them. To this end, there is space at the back of the book for you to write your own notes and reflections. There are some thoughts on diet, bits on breathing, some philosophical nuggets, a spot of prayer and poetry, sayings that help me through, exercises that I practice, and a sprinkling of mindfulness. This ancient Buddhist approach to life incorporates meditation and breathing exercises and has particularly helped me slow down. So too has a basic biology lesson, which I will share with you here. If you fail to relax, your body is forced to rely on backup energy courtesy of your adrenal system—a handy trick when running from a predator or chasing prey, but less than ideal as a strategy for everyday life. Your adrenal system runs on adrenaline and cortisol. These are the fight-or-flight hormones that keep you in a constant state of high alert. Cortisol also inhibits your brain’s uptake of the mood-elevating hormone serotonin, which makes you more prone to anxiety. We are designed to accommodate stress, but only in short bursts. That’s why the frantic twenty-four-hour stress that so many of us live with today is so damaging. I hope one or two of my steps may help you slow down and open doors to a place of greater happiness—and that you too may sometimes have that lovely feeling of walking on sunshine. "Hard to argue with a woman who proposes poetry as a means toward calm, and therefore happiness. She quotes Yeats’s 'The Lake Isle of Innisfree': “And live alone in the bee-loud glade. . . .” Try it. I took my blood pressure before and after. It dropped." "Small, simple steps to a happier life." "Kelly writes with charm and kindness about overcoming depression." "I absolutely LOVE this book. It's so gracefully accomplished and full of hope and practicality. Stretches out a hand to the lonely, the lost and the exhausted. It's a great gift of hard-won wisdom." "The new Chicken Soup for the Soul." "With philosophical gems, comforting poetry and breathing techniques, this inspirational read will bring brightness to the darkest of days."